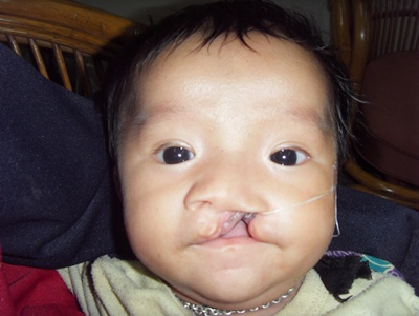 Jue Sae-yang, a newborn, comes from a tribal family in Laos and was born with cleft lip and palate. His parents are farmers. They earn the living by growing corn and rice and raising pigs. Their average income about 30,000 Baht a year (approximately $950 CAD) and they live with their large extended family. The family took two days and a border crossing to reach the hospital where our project is located in Thailand. Upon his first visit, he was given vaccinations for polio, diphtheria, pertussis and tetanus. Our nurse coordinator provided the mother with more information about how to properly breastfeed and with other information about cleft lip and palate. Jue Sae-yang’s cleft surgery was scheduled for July. Find out more about our work in Thailand here.